Hi everyone. Today I'm sharing two cards made from one panel with faux mother-of-pearl technique. I have a video on this fun and easy technique --- click HERE to watch it on YouTube. I haven't used this technique for a while, but since CAS Mix Up January Challenge is Cling Wrap, I just had to make some as cling wrap is used to add the glossy resist part of the technique. Basically I poured a couple drops of frost acrylic paint on my craft mat and then picked up the paint with a scrunched up piece of cling wrap. I pounced the wrap onto my mat to make sure the paint was distributed and I wouldn't end up with globs of paint in my background. Then I randomly, and lightly pounced my card panel, just leaving a little bit of the gloss, but with still lots of white space. Once dry, I sponged over top with distress inks, then took a dry paper towel to remove any ink that was sitting on top of the frost paint. For the first card (above), I heat embossed Altenew peony and leaf images in white and then watercoloured with the same distress inks used for my background. I layered the ink several times to create depth of colour, then fussy-cut. I cut out the middle of my panel to create a frame, stamped a sentiment inside the frame with Delicata silver ink, and then popped up the frame, adding a peony and leaf sprig on top. Here's a close-up. You can see the shimmer from the bits of frost paint. 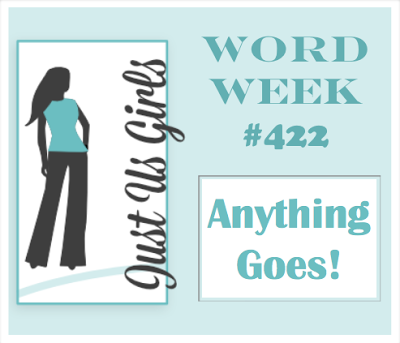 I'm adding the card above to the Just Us Girls Challenge #422 - Anything Goes and also at Altenew's January Inspiration Challenge. For my second card, I used the cut-out from the center of the card above, added a simple white die-cut which has the leaves shaped with a stylus and mat, and stamped the sentiment in Delicata silver. The faux mother-of-pearl panel is popped up for added dimension. 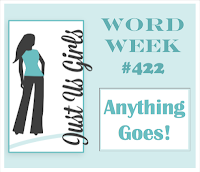 I'm adding this second card to the current Time Out Challenge #100 - We challenge you to be ... Thankful! Congrats to the Design Team at Time Out for hitting this wonderful milestone!! This card will be heading to a stamping friend. I am so thankful for all the wonderful crafters I have met since starting my blog ... and thankful to call many of them my friend! PS ..... can't believe I'm the first to comment!!! two beautiful cards Loll! 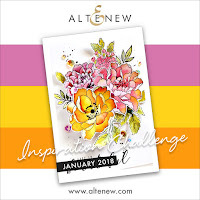 my plan was to use that technique this afternoon for making a card for the challenge - I haven't used it in a long time either and it is so pretty and fun to do. Gorgeous FMOP technique cards, Loll. 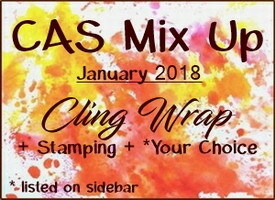 I am so glad you thought of this beautiful technique for our CAS Mix Up Cling Wrap Challenge. I often add a few sequins to help balance, yet not clutter a CAS image:-) Now I want to create a FMOP card...you always inspire me my friend. Hugs..and Thank You! That framing looks terrific both cards are fabby. Thanks for joining in at JUGS! Both cards are just beautiful, Loll! Your water coloring just gets better and better. How I love the look of the soft colors on this. I too had forgotten the faux mother of pearl technique so thanks for the reminder. Love the beautiful blending you achieved by sponging too. Gorgeous cards, the FMOP looks awesome. I love the soft colours and the beautiful colour combo. amazing fussy cut peony, it's soooooo pretty. Beeeeeeeeeeeeeeeeeeeeeautiful Bonnie. Amazing colouring and I know how stunning this card would be IRL with the Mother of Pearl technique. How good is it when you get 2 cards out of the same medium. I had forgotten about this technique. Thanks for the reminder! 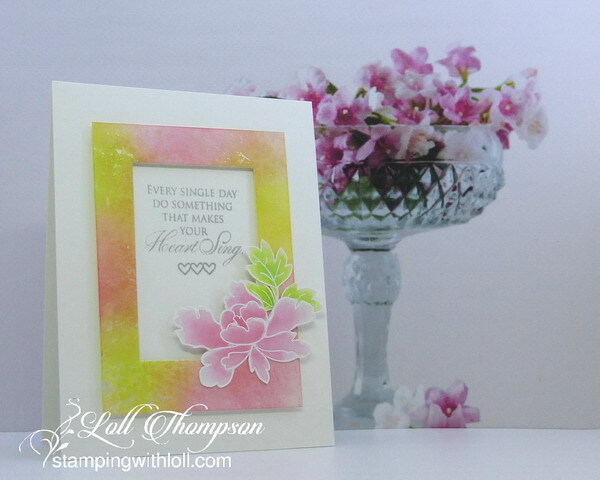 Love, love, love the mix of colors and both beautiful cards! Gorgeous cards! I've never used this technique but it is really pretty. Your cards are both gorgeous, Loll! The colors are soft and so perfect with that frosty paint. I watched your video too - what a great tutorial! Beautiful faux mother-of-pearl (one of my favourite techniques)! And I love the sentiment on the first card - great words to live by. Beautifully watercoloured peony! Two wonderful cards! A great pair or should it be a twofer! Love the colours, so cheerful. Oh so very pretty, Loll! I want to try this, it looks so beautiful...I will have to buy the frost paint first though! thank you for the video! Lovely cards, Loll. Oh that Mother of Pearl technique is so pretty. I really like your soft blend of colors with the pearl peeking through. Your flower is just lovely on the first card and the silhouette (you always use them so beautifully) on the second is wonderful. Thanks so much for sharing! Lucky friend indeed! Hugs! Really gorgeous cards, Loll! The effects of the Mother of Pearl technique is so beautiful and your choice of colors is perfect! I also love how you used the panel to create 2 cards...so clever of you! I'm going to watch your video again and I can't wait to play along! Your frame is so vibrant, Loll, and looks wonderful with the peony in the same colors. So great you could get a second card out of the faux mother of pearl. I'd forgotten about that technique too. It's now on my to do list. 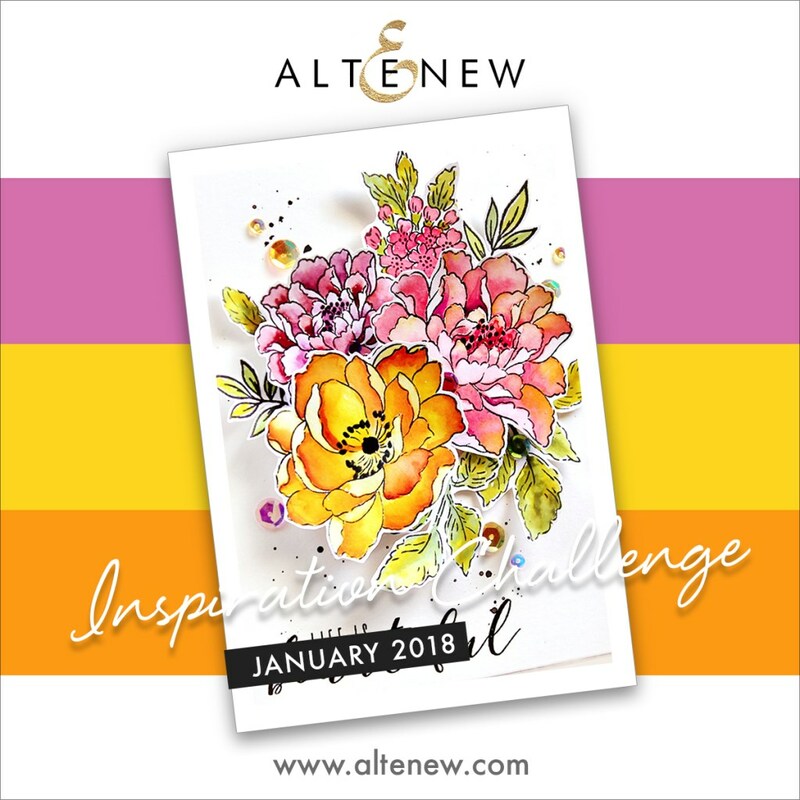 Two terrifically beautiful cards -- love the sarah technique and your colors are just to die for! Beautiful cards, Loll! I love those soft colours, and the delicate flower/leaf is so pretty. It makes me so happy when I can use every bit of a beautiful background and create two lovely cards at once like you have done with these! The colors remind me of spring (are we there yet?) - a feast for the eyes! This technique makes the background take on a beautiful pearly glow, in the rays of light it glitters and flashes like a fish scale in water or as a precious treasure. Your cards look stunning, I love their delicacy and feminine character. A friend will be delighted when he gets such a card. Loll, I'm sure many of us are proud of you calling us your friends. It is a real honor for us!